Ever since the emergence of Windows 10 upgrade updates, I've been avoiding installing most of the "Update for Windows 7 for x64-based Systems" updates whereas before I would install all of them without second thought. Of course I do look through these updates to see if there's any useful ones available though most of the time it seems like they're not that important to install ASAP. However when I look through the "important" updates, one of the "persistent" update is grabbing my attention: Windows Update Client for Windows 7 and Windows Server 2008 R2: [insert date]. Along with this update, I'm not sure if these are important to warrant compulsory installation every time a new version of this particular update are being released. It seems like they're frequently being offered which makes me think that it really is an important update to install. As a result do I need to install these particular updates regularly in the same way as installing security updates? Thanks guys and I appreciate your help. you can look up any offered WU KB, on the same screen you hide them on the right hand side it says details. Rule of thumb, if it mentions, telemetry or future updates >> Its W10 related. Thanks for the reply torch though my intention is to know if "Windows Update Client for Windows 7 and Windows Server 2008 R2" updates are necessary or not. The details shown for these updates doesn't really say anything important except for "contains some improvements to Windows Update Client" which, by reading the technical notes I'm not sure what exactly it provides. I guess these updates are not important to install at all? If you've got .NET Framework 4.6.1 installed then you might install the latest Windows Update Client. I do have NET Framework 4.6.1 installed though none of the WUC you've listed above has been installed. Is it necessary to install such update for NET Framework? Judging by your list, it looks like they don't seem to be must-get updates such as your usual security updates. I'm not sure why Windows marked these WUC as "important". Those marked "Important Updates" are geared towards both security and reliability. The WUC updates fall under the "reliability" category. If you are not experiencing any issues with Windows Updates performance then I guess you could avoid them. Most experienced users create a system image backup before installing any Windows Updates in case they need to roll back in the event of problems. 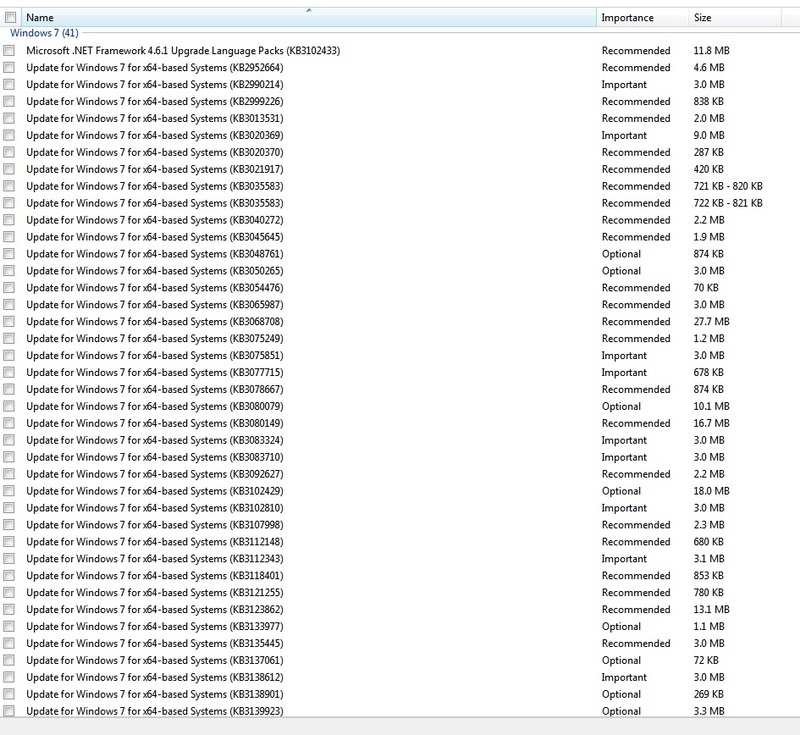 If you have such a system image backup - install the latest Windows Update Client. - If I happened to install the WUC update in future do I need to install all of the previous WUC installments? Or will the latest WUC update suffice? - Can I use system restore point as a "backup" or do I need a proper system imaging backup for this particular update? No you don`t need to install previous clients. If your update client is working fine, there`s no need to update. Imaging is always better then a system restore, but when it comes to updates you can always just uninstall it if it gives you a problem. Windows should create a restore point before doing anything, if worried create one yourself before proceeding. Windows update "2014 time zone update for Russia "
Win7 - "View Update History" vs. "Installed Update"